Researchers and fellows of CONICET work on the development of new antibacterials to treat this disease that affects 11,000 people a year in Argentina. Since their discovery, the antimicrobials have represented one of the most important advances for humanity for they have served to treat many infections caused by bacteria, fungus, parasites and viruses. Nevertheless, some of these microorganisms generate resistance, that is to say, they develop the capacity to evade the action of these drugs, prolonging the illness and raising the risk of death. For the World Health Organization (WHO), the use and misuse of antimicrobials in human medicine over the past 70 years has increased the number and types of microorganisms resistant to those drugs. For this reason, it became a public health problem of prime importance. One of the diseases most affected by this issue is tuberculosis, which attacks the lungs and it is caused by the Mycobacterium tuberculosis bacterium. It produces 11,000 cases a year in Argentina, according to the national Ministry of Health. 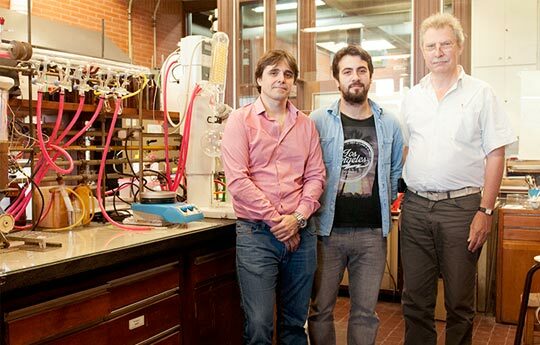 In order to solve the resistance to the antimicrobials used for treating tuberculosis, a group of CONICET researchers work with Richmond Laboratories for the development of compounds to treat the resistant strains of Mycobacterium tuberculosis. Gerardo Burton, senior researcher of CONICET, director of the Unidad de Microanálisis y Métodos Físicos Aplicados a Química Orgánica (UMYMFOR, CONICET-UBA) and member of the project, affirms: “Worldwide, in the last years, few antibacterials were developed and thus there is a problem of resistance to the existing ones. For this reason, we need to move towards new substances, change the strategy to fight against the bacterium and attack where it is not resistant”. For his part, Mario Martínez, doctoral fellow of CONICET at the University of Buenos Aires and member of the team, states: “The current treatment to combat tuberculosis is deficient; it consists of a cocktail of medications that the patient has to take for 3 or 6 months and consequently the person suffers from hepatic disorders. The idea is to try to find a new drug with better indexes of tolerance”. The team of scientists carried out the first stage of the study which consisted on searching for new chemical entities with antibacterial properties and structures different from the conventional antibiotics. They investigated fluorinated compounds derived from caffeic acid and specifically the introduction of difluoromethyl groups in the molecules for the particular properties they have. “When we started the research we noticed that there were not antibacterial compounds that contained difluoromethyl groups in their structure. We added them and tested the action of these functional groups. As we explored them, we found that this change increased their antibacterial activity in regard to the original compounds and thus it turned them selective against Mycobacterium”, Fernando Durán, assistant researcher at the UMYMFOR and collaborator of the project adds. Likewise, Martínez adds that although the importance of the new compounds lies in their effectiveness and selectivity against the mycobacterium, some of the synthesized compounds also work in other microorganisms highly resistant to drugs. “We found moderate antibacterial activity in other pathogens related to hospital infections and that activity could be improved so as to attack them”, he comments. The finding is part of a long process that continues with the screening stage that will be performed by Richmond Laboratories. Elvira Zini, director of Technical and Science Issues of the laboratory, explains that the company is in charge of the preclinical trials of microbial activity. These trials consist in searching for the target, that is to say, the type of bacteria that these new compounds target for, and then analyzing their mechanism of action. With these results, Burton’s team will be able to make the necessary chemical modifications to improve the drugs. However, scientists warn that the commercialization is the closure of a long cycle that may take between 5 and 10 years. That is because the preclinical trials required by all competent entities have to be conducted so as to obtain its approval and be launched into the market. “The Richmond Laboratory, as all Argentine companies, would be very proud if this new drug were developed in the country. I wish it would happen but this type of studies take time”, Zini remarks.